- Publisher I hate it. I love it. Sometimes our desires can be cruel lovers. We think we should be rid of a particular desire, but we feel stuck. ?What's the use in trying to rid my life of this desire?? we ask ourselves. ?I?ve tried, but there's just no way out for me.? Or is there? The problem may be more complicated than just being stuck. Might there be a path to true change? (If so, would you want to take that path?) Edward T. Welch may surprise you with his answer. Along the way he will introduce you to someone with words of comfort and hope you may never have heard before. - Publisher This book will show you how and why you should rid yourself of your desires. It will tell you that there is a way out for you. Your problem may be more than being stuck with your desires. The answers in this book may surprise you. You will also be introduced to someone with words of comfort and hope you may have never heard before. About "Just One More: When Desires Don't Take No For An Answer (Resources For Changing Lives Series)"
I hate it. I love it. Sometimes our desires can be cruel lovers. We think we should be rid of a particular desire, but we feel stuck. ?What's the use in trying to rid my life of this desire?? we ask ourselves. ?I?ve tried, but there's just no way out for me.? Or is there? The problem may be more complicated than just being stuck. Might there be a path to true change? (If so, would you want to take that path?) Edward T. Welch may surprise you with his answer. Along the way he will introduce you to someone with words of comfort and hope you may never have heard before. 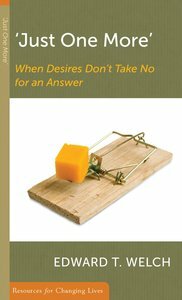 This book will show you how and why you should rid yourself of your desires. It will tell you that there is a way out for you. Your problem may be more than being stuck with your desires. The answers in this book may surprise you. You will also be introduced to someone with words of comfort and hope you may have never heard before.